I had a bunch of corn on hand and after all of the tacos and burgers lately I was looking for something on the lighter side. The first thing that came to mind of course was a salad and I was thinking of a whole grain with quinoa. Given the Mexican theme that I have been on lately the next things that went into the salad were some black beans, a red pepper and a jalapeno pepper for some heat. Just one jalapeno pepper was not going to make it hot enough for me so I decided to add some more heat in the form of a chopped up chipotle in adobo sauce in the dressing. I always enjoy a nice whole grain salad as they are nice and light and yet filling and satisfying and this one was no different. The smoky chipotle dressing added the perfect amount of heat which was balanced nicely by the sweet corn and red pepper. The black beans added a nice creaminess and the cilantro and lime made the salad nice and fresh. This salad was great when I first served it while it was still warm from cooking the quinoa and the leftovers were really nice when served chilled straight from the fridge. Simmer the quinoa in the water until the water is absorbed, about 20 minutes. 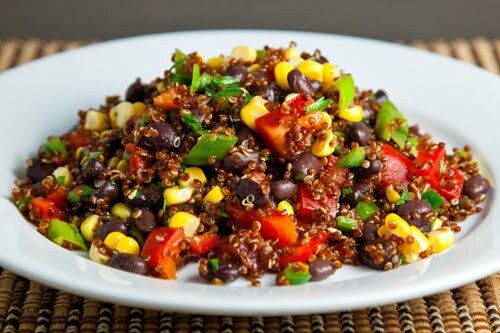 Mix the quinoa, black beans, corn, red pepper, jalapeno, green onion, and cilantro in a large bowl. Mix the oil, lime juice, chipotle in adobo sauce, cumin, salt and pepper in a small bowl. Take a look at the No Croutons Require roundup at Tinned Tomatoes. That is such a colorful dish! Very yummy! What a beautiful plate of food, and I love the sound of every single ingredient on it. Tasty and healthy, nice recipe and great pic! What a gorgeous looking salad! That does look great, Kevin. Don't even need a fork, I'll just shovel it in with some tortilla chips, yum! This is a perfect lunch recipe! I love to make make big quinoa salads (the red quinoa is great, isn't it?) and have it for lunch several days in a row. I"ll have to try adding a chipotle pepper. Yours sounds so tasty! How do you cook your qinuoa in 2 cups water? My quinoa always comes out soggy, but when I cook my quinoa in 1-1/2 cups water, it comes out perfect: separated and fluffy. What a delicious and healthy salad. Love the fact that is colorful as well. I've enjoyed a number of salads like this recently. Quinoa and bulgur both make for a nice base in creating a healthy one-meal dish, and with the abundance of sweet corn, the possibilities are all over the board. I wish I could find red quinoa at our natural foods store. What a great dish! Love red quinoa, it's so good for you, not to mention the incredible color as well! Nice dish. Kevin, I wonder if you put in cooked chicken cubes with that you could make it meal? It looks fantastic. I love quinoa! I love how colourful this is, it looks stunning. Such a healthy and colorful salad! Yum. Looks really tasty. I still need to try quinoa. The more recipes I see using it, the more I want to get me some. This looks fantastic. So light and healthy, yet filling! One of my all-time favorite gluten-free grains!! Fabulous dish. kevin…in two minutes or less,as I'm waiting on my (your Clafouti)…I just came across your site insearch of abve-mentioned recipe… ohmy goodness!!!! everything here looks so yummy! I mean, I think we're on the same wavelength, foodwise that is… Anyhow, thanks for all your great work, and I will surely be back! Yay for the vegetarian dish! Looks great. Anonymous: The two to one ratio seems to work well for me. You could also test it while cooking and as soon as the quinoa is nice and tender pull it off the heat and strain the extra liquid away. Lina: To make it even more effortless cook the quinoa in a rice cooker. Yum – I make a version of this salad for lunches quite frequently. Quinoa + veggies + vinaigrette is always a winning combo, and is especially good right now with the sweet corn in season! I have recently been looking for some good Quinoa recipes. Can't wait to try it, I already have all the ingredients at home! drool, kevin. what a gorgeous and delicious dish. You are becoming my quinoa source! such pretty colors! I have quinoa today too. going to do this spicy south western kind next time. i do a similar version that is always a hit! This is beautiful. I haven't tried red quino yet. I've been looking for some ways to use up our fresh corn and will give this a try. Quinoa is one of my favorites and your flavor combinations are top on my list too! I will have to give this one a try! Thanks for sharing your recipes. Your blog is great! I acutally made this recipe tonight. It was very good. The only thing I did difference was double the amount of quinoa because I preferred more quinoa than bean, corn and peppers. I doubled the dressing and followed the rest of the ingredients as written. The salad is delicious and I'm sure it will taste even better tomorrow, afterall, I made the salad tonight for tomorrow's dinner. Serving this salad with grilled cod fillets. Can't wait for dinner. Salad is awesome…also tastes better with age. I had made this 3 days ago and it still tastes good. Thanks Kevin! Since you like Korean foods, check out http://www.mangchi.com She is fun to watch and her recipes are authetic! l'm trying this tonight; it looks so yummy! Thanks for sharing. I made this for dinner the other night, and it was delicious! My whole family, even my brother, who was VERY skeptical about trying quinoa, enjoyed this dish. I ate the leftovers for lunch the next day, and it was even better. Thanks for a great recipe! Hey there 🙂 I wanted to let you know I've included this recipe in my new "5 Recipes I would love to make" feature on my blog. I've had it bookmarked for a very long time 😉 Please let me know if you'd like me to remove it from my list. What a great idea, and so colorful! I made my own spin on this (and blogged about it) adding avocado and tomato.